Photo: Sheeley House, ca. 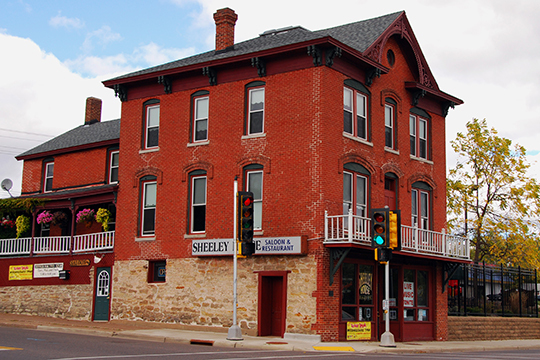 1884, 236 West River Street, Chippewa Falls, WI. Listed on the National Register of Historic Places in 1985. Photographed by User:kellyflys (own work), 2012, [cc-by-3.0 (creativecommons.org/licenses/by/3.0)], via Wikimedia Commons, accessed October, 2017. The Chippewa County Courthouse is located at 711 North Bridge Street, Chippewa Falls, WI 54729; phone: 715-726-4597. Louis Hennepin and his companions were the first Europeans to traverse the Chippewa County area. They journeyed up the Chippewa River in 1680. The first permanent settlement in the area was established in 1822, when a sawmill was built along the Chippewa River. Soon after that date, the valley of the Chippewa River became an important lumber region. White pine was abundant in the virgin forests. In 1837, the largest sawmill in the world was built in Chippewa Falls. The Chippewa County area was at one point part of the territory of Michigan. In 1836, the territory of Wisconsin was established. It had three counties; Crawford, Milwaukee and Brown. In 1845, Chippewa County was formed from Crawford County. Chippewa Falls was declared the county seat. Chippewa County originally included about one-fourth of Wisconsin. Following 1845, numerous counties were detached from the original county. Chippewa County derives its name from the Native American word "Ojibwa," the name of a Native American tribe. The early settlers included Canadians and French and some English, Irish and Scots. German and Norwegian settlers came somewhat later. They were farmers. Dairying became the predominant farm activity by the turn of the century. Since then, the county has become one of the cheese-making centers of the nation. Chippewa County, Wisconsin, Comprehensive Plan, 2010, www.co.chippewa.wi.us, accessed October, 2017.